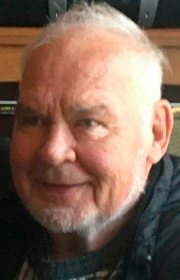 Roland “Butch” Lau, 81, of Fort Dodge, peacefully passed away on Monday, February 19, 2018, at the Paula J. Baber Hospice Home in loving care of his family. The funeral service will be held at 10:30 a.m. on Tuesday, February 27, 2018, at the Gunderson Funeral Chapel with Pastor David Barton officiating. Burial will follow at Memorial Park Cemetery. Visitation will be from 4:00 to 7:00 p.m. on Monday at Gunderson Funeral Home & Cremation Services. Butch was born in the Algona area on February 25, 1936, to Albert and Kathryn (Smith) Lau. He graduated from Fort Dodge Senior High School and was united in marriage to Ila Fay Staecker on October 30, 1955. The couple ran Butch & Fay’s Friendly Tavern in Farnhamville for many years. He also worked various positions for USG until his retirement. After retiring he worked in sales for Fort Dodge Steel. He was a proud member and past president of the Eagles Club and was a member of Rolling Hills Community Church. He enjoyed playing golf, throwing darts, bird watching, gardening, landscaping; being outdoors and spending time with his family and friends. Butch is survived by his daughter Gwen Greer and Son Terry Lau; grandchildren Kevin (Amanda) Greer, Kristine Sharkley, Kathryn Olson, Brian Donnelly, Joseph Lau (Kaymine Loerch), Patrick (Loretta) Lau, Kellie Lau (Kent Debus), Deanna (Austin) Smith and many great-grandchildren and great-great-grandchildren; his sister Carol; brothers Max, Tom and Michael and many nieces and nephews. He was preceded in death by his loving wife Ila Fay Lau; his parents Albert and Kathryn Lau; his brother Larry Lau and his sister Jan Auten.